Each 100 mL of R-Gene® 10 (Arginine Hydrochloride Injection, USP) for intravenous use contains 10 g of L-Arginine Hydrochloride, USP in Water for Injection, USP (equivalent to a 10% solution). L-arginine is a naturally occurring amino acid. R-Gene 10 is hypertonic (950 mOsmol/liter) and contains 47.5 mEq of chloride ion per 100 mL of solution. The pH is adjusted to 5.6 (5.0â€“6.5) with arginine base or hydrochloric acid. Intravenous infusion of R-Gene 10 often induces a pronounced rise in the plasma level of human growth hormone (HGH) in subjects with intact pituitary function. This rise is usually diminished or absent in patients with impairment of this function. These ranges are based on the mean values of plasma HGH levels calculated from the data of several clinical investigators and reflect their experiences with various methods of radioimmunoassay. Upon gaining experience with this diagnostic test, each clinician will establish his/her own ranges for control and peak levels of HGH. L-arginine is a normal metabolite in animals and man and has a low order of toxicity. If the insulin hypoglycemia test has indicated a deficiency of pituitary reserve for HGH, a test with R-Gene 10 is advisable to confirm the negative response. This can be done after a waiting period of one day. As patients may not respond to R-Gene 10 (Arginine Hydrochloride Injection, USP) during the first test, the unresponsive patient should be tested again to confirm the negative result. A second test can be performed after a waiting period of one day. Some patients who respond to R-Gene 10 do not respond to insulin and vice versa. The rate of false positive responses for R-Gene 10 is approximately 32%, and the rate of false negatives is approximately 27%. The administration of R-Gene 10 is contraindicated in persons having known hypersensitivity to any ingredient in this product. There have been reports of overdosage of R-Gene 10 in pediatric patients leading to death. EXTREME CAUTION MUST BE EXERCISED WHEN INFUSING R-GENE 10 INTO PEDIATRIC PATIENTS. OVERDOSAGE OF R-GENE 10 IN PEDIATRIC PATIENTS CAN RESULT IN HYPERCHLOREMIC METABOLIC ACIDOSIS, CEREBRAL EDEMA, OR POSSIBLY DEATH. Hypersensitivity reactions, including anaphylaxis have been reported. Appropriate medical support should be available during R-Gene 10 administration. If anaphylaxis or other serious hypersensitivity reaction occurs, R-Gene 10 should be discontinued and appropriate medical treatment initiated. R-Gene 10 should always be administered by intravenous infusion because of its hypertonicity. R-Gene 10 is a diagnostic aid and is not intended for therapeutic use. R-Gene 10 is a hypertonic (950 mOsmol/liter) and acidic (average pH of 5.6) solution that can cause irritation and damage to tissues. Care should be used to ensure administration of R-Gene 10 through a patent catheter within a patent vein. Excessive rates of infusion may result in local irritation and in flushing, nausea, or vomiting. Inadequate dosing or prolongation of the infusion period may diminish the stimulus to the pituitary and nullify the test. The arginine in R-Gene 10 can be metabolized resulting in nitrogen-containing products for excretion. The effect of an acute amino acid or nitrogen burden upon patients with impairment of renal function should be considered when R-Gene 10 is to be administered. The chloride content of R-Gene 10 is 47.5 mEq per 100 mL of solution, and the effect of infusing this amount of chloride into patients with electrolyte imbalance should be evaluated before the test is undertaken. It should be noted that the basal and post stimulation levels of growth hormone are elevated in patients who are pregnant or are taking oral contraceptives. Long term animal studies have not been performed to evaluate the carcinogenic potential, the mutagenic potential or the effect on fertility of intravenously administered R-Gene 10. Reproduction studies have been performed in rabbits and mice at doses 12 times the human dose and have revealed no evidence of impaired fertility or harm to the fetus due to R-Gene 10 (10% Arginine Hydrochloride Injection, USP). There have been no adequate or well controlled studies for the use of R-Gene 10 in pregnant women. Because animal reproduction studies are not always predictive of human response, this drug should not be used during pregnancy. It is not known whether intravenous administration of R-Gene 10 could result in significant quantities of arginine in breast milk. Systemically administered amino acids are secreted into breast milk in quantities not likely to have a deleterious effect on the infant. Nevertheless, caution should be exercised when R-Gene 10 is to be administered to nursing women. Clinical studies of arginine did not include a sufficient number of subjects aged 65 and over to determine whether they respond differently from younger subjects. Other reported clinical experience has not identified differences in responses between the elderly and younger patients. Non-specific side effects consisting of nausea, vomiting, headache, flushing, numbness and local venous irritation were reported in approximately 3% of the patients. One patient had an allergic reaction which was manifested as a confluent macular rash with reddening and swelling of the hands and face. The rash subsided rapidly after the infusion was terminated and 50 mg of diphenhydramine were administered. One patient had an apparent decrease in platelet count from 150,000 to 60,000. One patient with a history of acrocyanosis had an exacerbation of this condition following infusion of R-Gene 10. The following adverse events have been reported during post-marketing use: extravasation leading to burn-like reaction and/or skin necrosis requiring surgical intervention, hypersensitivity reactions including anaphylaxis, and hematuria that in some cases occurred 1â€“2 days after an R-Gene 10 administration. Because these adverse events are reported voluntarily from a population of uncertain size, it is not always possible to reliably estimate their frequency or establish a causal relationship to drug exposure. An overdosage may cause a transient metabolic acidosis with hyperventilation, which could lead to death (see "WARNINGS"). In most cases the acidosis will self-compensate and the base deficit will return to normal following completion of the infusion. If the condition persists, the deficit should be determined and corrected by a calculated dose of an alkalizing agent. The recommended adult dose is 30 g arginine hydrochloride (300 mL of R-Gene 10) administered by intravenous infusion over 30 minutes. The total dose should not exceed 30 g arginine hydrochloride. See Directions for Use for preparation instructions. The recommended pediatric dose is 0.5 g/kg arginine hydrochloride (5 mL/kg of R-Gene 10) administered by intravenous infusion over 30 minutes. The total dose should not exceed 30 g arginine hydrochloride. For patients weighing 59 kg or less, withdraw a weight based dose from a sealed R-Gene 10 bottle and place in a separate container for intravenous infusion to avoid the inadvertent delivery and administration of the total volume from the commercially available container. See Directions for Use for preparation instructions. The test should be scheduled in the morning following a normal night's sleep, and an overnight fast should continue through the test period. Patients must be placed at bed rest for at least 30 minutes before the infusion begins. Care should be taken to minimize apprehension and distress. This is particularly important in children. 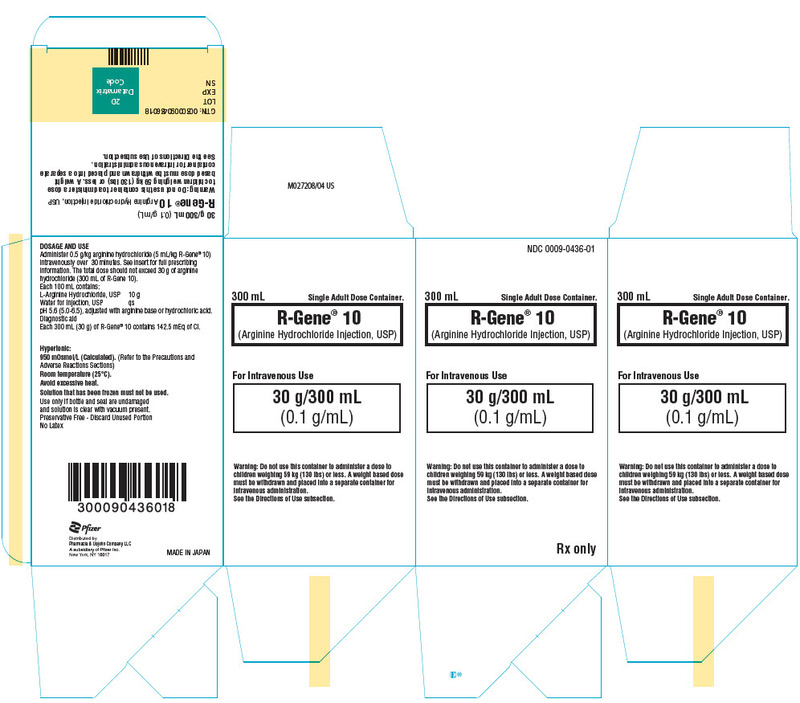 R-Gene 10 (Arginine Hydrochloride Injection, USP) is a hypertonic solution and should only be infused through an indwelling needle or soft catheter placed in an antecubital vein or other suitable vein (see PRECAUTIONS). Blood samples should be taken by venipuncture from the contra-lateral arm. A desirable schedule for drawing blood samples is at âˆ’30, 0, 30, 60, 90, 120 and 150 minutes. R-Gene 10 should be infused beginning at zero time at a uniform rate which will permit the recommended dose to be administered over 30 minutes. Blood samples should be promptly centrifuged and the plasma stored at âˆ’20°C until assayed by one of the published radioimmunoassay procedures. Diagnostic test results showing a deficiency of pituitary reserve for HGH should be confirmed by a second test with R-Gene 10, or one may elect to confirm with the insulin hypoglycemia test. A waiting period of one day is advised between tests. R-Gene 10 is provided as a ready-to-use solution for patients weighing 60 kg (132 lbs) or more and should not be further diluted. For pediatric patients weighing 59 kg (130 lbs) or less a dose must be placed in a separate container. Follow the preparation instructions below. Withdraw a weight-based dose from an intact sealed bottle of R-Gene 10. The entire 300 mL bottle of R-Gene 10 for infusion is not intended for use in patients weighing 59 kg or less. The dose must be placed in a separate container, such as an evacuated sterile glass container designed for intravenous administration, using aseptic technique. Additionally, R-Gene 10 is stable in polypropylene syringes and plastic containers made of either polyvinyl chloride (PVC) or ethylene vinyl acetate (EVA). The post-penetration storage period is not more than 4 hours including infusion time at room temperature or 24 hours at refrigerated temperature (2-8°C). The healthcare professional administering the dose should verify the accuracy of the dose prior to administration. Use only if the solution is clear. Discard any unused drug product. Follow these directions using aseptic technique. As R-Gene 10 for intravenous use is provided in glass containers, a standard air-inletting, air-filtering intravenous infusion set with a bacterial air filter is required. Use only if solution is clear and seal is intact. Carefully examine bottle for evidence of damage, e.g., small cracks, dents in seal, or areas of dried powder on exterior. Do not administer contents if such damage is found. Remove plastic flip off lid from bottle to expose rubber stopper, taking care that you do not contaminate the target site of the stopper with fingers, hair, clothing, etc. Immediately perform step #3. Promptly invert bottle to automatically establish fluid level in drip chamber and to check for vacuum by observing rising filtered air bubbles. Discard bottle if there is no vacuum or if the solution is not clear. Clear tubing of air. Proceed with infusion. R-Gene 10 is supplied as a 300 mL fill in 500 mL glass containers. Preservative Free: Discard any unused portion. Exposure of pharmaceutical products to heat should be minimized. Avoid excessive heat. It is recommended that the product be stored at room temperature (25°C); however, brief exposure up to 40°C does not adversely affect the product. Solution that has been frozen must not be used. See the Directions of Use subsection.